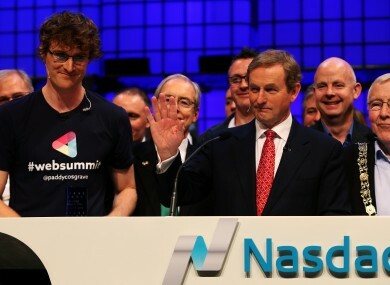 Co-founder Paddy Cosgrave made the announcement the event was leaving Dublin today. THE DUBLIN WEB Summit will be shifted to the Portuguese capital of Lisbon next year. Co-founder and CEO Paddy Cosgrave said this morning that after “careful consideration” the company had decided to move the event. The announcement comes after more than a month of speculation that organisers could shift the conference to one of several alternative locations, including Amsterdam or London. The company would not reveal what incentives were offered as part of its final decision to move to Lisbon after whisperings that it was pushing for a better deal from state agencies to stay in Ireland, however Portuguese media reported government “investment” in the event totalled €1.3 million per year. “We chose Lisbon because of the strong infrastructure in the city, the amazing venue and the thriving startup community,” Cosgrave said in his statement. The tech conference, which organisers expect to bring in 30,000 attendees this November, was launched five years ago in the Irish capital with a few hundred industry figures. By last year it had grown to over 22,000 attendees at Dublin’s RDS Arena. Fáilte Ireland has put the value of the 2014 Web Summit to the Irish economy at €100 million. However the event was plagued with WiFi problems and concerns were also raised about price gouging by hotels and guesthouses in the capital during the event. Cosgrave said the Web Summit organisers would “always be grateful for the support and encouragement” they received from Dublin and the Irish authorities. When asked what financial incentives had been provided to move the event to Lisbon, a spokesman for the Web Summit told TheJournal.ie the company would “not comment on confidential commercial agreements”. Figures from the IDA showed the state development body spent €320,000 on both the Web Summit and F.Ounders events in Dublin between 2012 and 2014. A spokesman said the spend was in line with that from other organisations wanting to “secure access and high-profile branding” at the events. The sums included tickets, exhibition space and other perks. Enterprise Ireland spent about €456,000 on participation fees for the event between 2011 and 2014, and another €69,000 in costs on stands. The agency recorded €36,750 in income from last year’s event. A spokesman said Enterprise Ireland was “delighted” to be partners with the Web Summit since its foundation and it was disappointed to hear of the move. The Web Summit has also received “significant financial and non-financial support” from other state publicly-funded bodies including Fáilte Ireland and Dublin City Council, among others, according to a spokesman for the Department of Jobs, Enterprise and Innovation. In a blog post further explaining the decision, Cosgrave said the new “state-of-the-art venue” in Lisbon, the MEO Arena, would have the capacity for more than 80,000 attendees next year. A spokesman for the RDS said the Web Summit was a “great event for Dublin” and it was “regrettable” the decision had been taken to move it next year. The event’s organisers have agreed a deal to bring in a third-party WiFi provider for this year’s summit. Cosgrave said the company remained Irish, employing 130 people in its Dublin headquarters. It has launched a number of spin-off conferences, including Collision in the US and RISE in Hong Kong. Email “Web Summit paid only €1.3 million for Lisbon move”. Feedback on “Web Summit paid only €1.3 million for Lisbon move”.